How to play Blu-ray movie on iPhone? HandBrake gives a hand! It is not a joke to play and watch Blu-ray movie on iPhone! But you may have tons of questions to ask, like How to reduce 50G Blu-ray to iPhone utmost 32G storage? How to shrink Blu-ray 1920 x 1080 image to iPhone 960 x 640 size? How to make iPhone recognize Blu-ray M2TS BDAV video? Do not worry, after finish reading this Handbrake Blu-ray to iPhone tutorial, you can do it. Handbrake Project had released a major update of its open-source, cross-platform video conversion tool. This was the first update since November 2009 and introduced a number of major improvements that helped speed up the conversion process. And the most shining spotlight was to add Blu-ray as input and iPhone profile settings as output. With Handbrake 0.9.5, you do not have to create Handbrake iPhone presets for converting discs/videos to iPhone. 1. Handbrake of cause. Make sure your Handbrake is version 0.9.5 or later. The latest version (1.2.0) is the best. 2. D****b or A****d or other software that can decrypt encrypted Blu-ray discs. The same situation you have when ripping copy-protected DVD with Handbrake. 3. Make sure your Blu-ray disc is playable on Blu-ray Player. As if you've got a BD filled with video files, such as AVI, MPG, WMV, MOV, etc, Handbrake won't convert them. 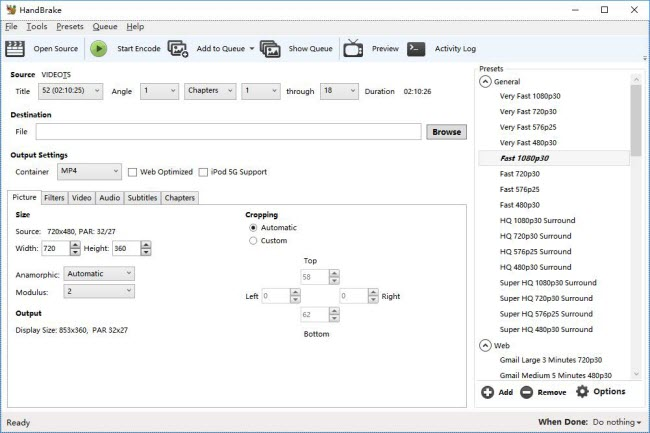 Handbrake is designed to convert just about any video (including ripping unencrypted discs from DVD and Blu-ray) into the MP4 or MKV format, even support converting MKV to MP4. Below is main interface of Handbrake 0.10.2. If you are not quite familiar with it, then you can give Handbrake Windows Tutorial or Mac tutorial for Handbrake a check. D****b is available for $60 per year. After installing it on your computer, Handbrake will be empowered to read Blu-ray discs with latest copy-protection. Usually after installing D****b, a dialog will recommend you reboot computer for better running. Handbrake Alternative to Rip Blu-ray to iPhone, iPad etc. If you can not bear the complexity of installing third-party software to assist Handbrake rip Blu-ray to iPhone, or you just need faster and more convinient Blu-ray to iPhone ripping solution, then here is an alternative for Handbrake - WinX Blu-ray DVD to iPhone Ripper. This Bluray iPhone ripper is updated to perfectly rip and backup all Blu-ray movie discs, then to iPhone Xs/Xr or previous models, iPad Pro/Air/Mini, iPod Touch, Apple TV, iTunes, iMovie etc, with lossless quality. Handbrake is a very powerful and very efficient tool to have, especially if you have a huge collection of Blu-ray/DVD/video movies that you want to back-up, or to watch on different media. However, there are a few things to keep in mind. 1. Always check the copyright notices on the Blu-ray you plan to copy. Make sure you have full copy right of your Blu-ray or source video, and never use Handbrake for illegal purposes, such as for piracy or commercial gain. a. First select the Enable Queue options. b. Set up all of the options for each episode. c. Click, Add to Queue. d. Repeat for each episode. 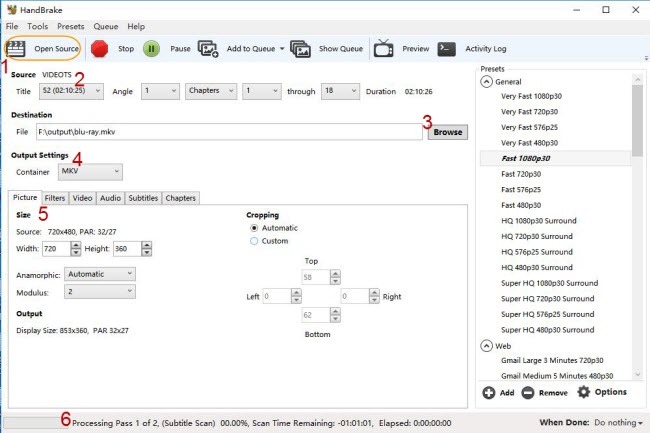 What are the best Handbrake Bluray settings? Read this tutorial and learn how to HandBrake rip Blu-ray to MP4/MKV with subtitles, audios in high quality. Follow this guide to convert or rip Blu-ray to MKV while keeping all video/audio/subtitle tracks. Part3Handbrake Alternative to Rip Blu-ray to iPhone, iPad etc.